It seems like Bartending is heading back to its roots… pardon the pun. The trend of Bartending is now shifting to honoring the classic drinks with added a bit of Flair and focusing on proper bartending and mixology as well as entertaining your guests. For those of you that don’t know, Mixology is the art of making great cocktails. From a classic Skyy Vodka and cranberry to the ever popular Bacardi Mojito. 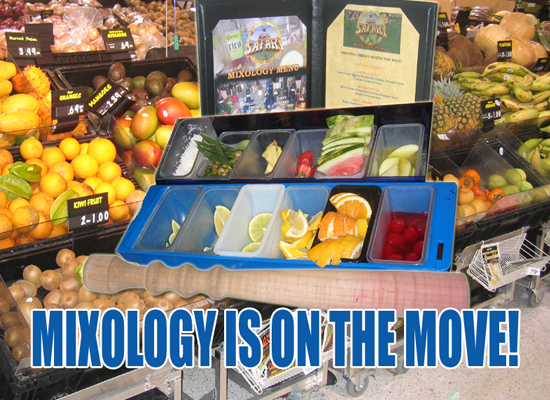 MIXOLOGY IS ON THE MOVE! We are witnessing more and more bartenders and Flair Bartenders wowing the crowd with their show stopping Flair with half full bottles being tossed in the air with ease and not spilling a drop wetting the pallets of their highly entertained guests before they get to sip on the sweet nectar of an original cocktail made with tender loving care with fresh ingredients and new products and spices. At my bar alone I use fresh pineapple, strawberries, cucumbers and watermelon along with two types of Simple Syrup and a range of spices from cinnamon to basil. 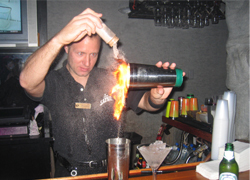 There used to be a distinct separation between classic mixologists and the new cutting edge Flair bartenders. Now the lines are being more overlapped… As I said before… “The professional Flair bartender is the evolution of the bartender” and because they take the time to know as much about their trade as possible we are now seeing Flair bartenders learning more about spirits, liquors, recipes and classic cocktails and being concerned with the quality of the drink as well as the presentation in the preparation. On the flip side we are seeing more classic mixologists who used to be only concerned with the final product now intrigued with the whole entertainment value of “making” a great drink in front of their guests. 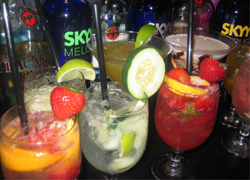 Mixology is bringing back decadent drinks with fresh fruit, vegetables, spices and different combinations of liquors. With a variety of new products such as the many flavors of Finest Call Premium mixes and all the new flavors of liquor that are emerging, this trend in flavors is giving bartenders an itch to get out there and create something new. Muddling is being used as a common word and more and more muddlers of various shapes and sizes are being seen behind the bar. More and more techniques are being explored to mix a tasty masterpiece then ever. We are seeing more and more drink menus at bars and restaurants with not only classic cocktails but new original drinks as well then ever before. The bar business is a highly profitable one, so why not give your guests more choices and perhaps introduce them to something new. Create more sales and possible repeat business by Implementing a Specialty Drink menu at your establishment. See how it mixes with your clientele. It is a great marketing tool as well. Use it to further advertise your venue and certain specials and promotions. Motivate your bartenders, have them come up with an original drink and then name the drink after them in your specialized drink menu. This will make your establishment more friendly and inviting as well as boost the moral of your bar staff. What will it really cost you… A little bit of liquor and time experimenting with drinks and some plastic coated drink menus? You probably already have some somewhere collecting dust under a booth or even better you can always get a local liquor distributor to donate some. That is just more advertising for them and now you as well. Do something different to stand out. Make your presence be known. Buy a cocktail or drink recipe book. Read it! Learn more. Educate yourself. Try something new and see how it tastes… How can you make it better? Hopefully this inspires you to be daring and try something different. I dare you to see how different combinations of liquor and mixes taste and fit different flavor profiles. Define yourself in a drink… be adventurous! There are countless ways and techniques to craft the perfect cocktail… What is yours?